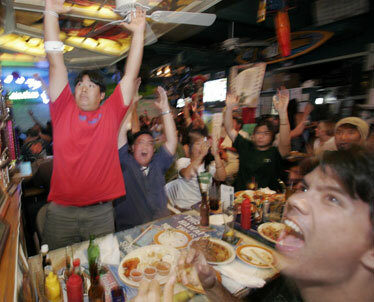 Daniel Andrade, right, and Rob McGehe reacted along with a packed bar last night after a University of Hawaii touchdown during a showing of the nationally televised football game between Hawaii and Nevada at Murphy's Bar and Grill in downtown Honolulu. Despite yesterday being the 20th anniversary of Murphy's Bar and Grill, Marion Murphy could only think about one thing: University of Hawaii football. "It's nerve-racking," Murphy said during a block party to celebrate the Merchant Street bar's anniversary. "I've been so concerned about the football game today." Murphy and husband Don, who owns the bar, are loyal Warriors fans. As part of the anniversary celebration, they set up a big screen to broadcast the game, tables, and food tents serving Murphy's tailgating menu items. "Thought it would be fun," Don Murphy said, adding that some of the proceeds would help the Hawaii Children's Cancer Foundation. "What better way to celebrate our 20th anniversary?" Marion Murphy said they could have had a rock band to celebrate but felt Hawaii football was a perfect fit. "I love this," she said behind her brown-framed glasses. "These guys have so much heart." Jeff Bates cheered on the Warriors last night as they played against Nevada. He watched the game at Eastside Grill on University Avenue. Several hundred people attended the party, both inside the restaurant and out on the street, shortly after 6 p.m.
People sat at tables or milled along the sidewalks, watching undefeated UH play Nevada. 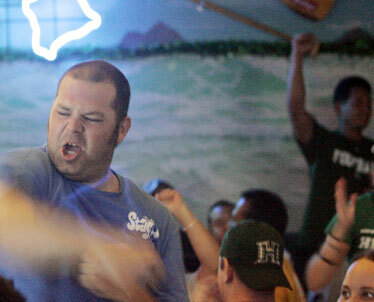 When UH scored in the first half, Don Murphy raised a blue flag donned with Hawaii's H, running up and down the aisle. Jay Thompson-Westra and two friends joined the outdoor revelry after finishing work at a Bishop Street office. Thompson-Westra, a 23-year-old engineer, wore a green Hawaii T-shirt to work yesterday in preparation for the game. "The atmosphere is great. There's a lot of people out," he said. "It's a good location and great game. What more could you want?" Along the sidewalk, Donald Koelper watched the game and said he was he was cautiously optimistic about UH's chances for an undefeated season. "They never made it yet," said Koelper, a fan of 25 years. "They just have to stay focused and tune out what everybody's expecting." He said he hopes the excitement surrounding UH's 11-game winning streak becomes a step "to seeing more sustained support for UH in the future." "Fans in Honolulu are rather fickle," he said. Randy Isokane, above left, Jeff Imamura and Marcus O'Connell, far right, went crazy at Eastside Grill after Hawaii scored against Nevada. 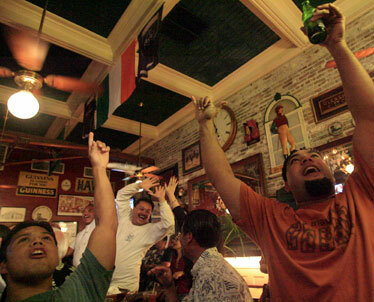 Fans near Murphy's Bar and Grill in downtown Honolulu jammed Merchant Street during last night's game. 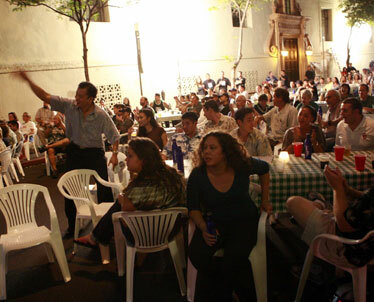 Bar patrons and customers were treated to a huge projector screen showing of the game as police shut down a block of the street for the occasion.